Can I send a bike using a courier service? Yes! With Parcel Monkey, you can easily send any bike with next day delivery - at some of the cheapest courier rates possible. We also have delivery services for Adult Bikes, whilst international delivery for bikes is available to some locations, just add your parcel dimensions to obtain a courier quote! Prices will depend on which courier you use, where you are shipping to and how heavy or large the box is. We advise to take the measurements of your bike box, or find your bike dimensions online and add them to our quote engine. Also, add the delivery postcodes can impact on the cost of sending your bike. Please note couriers do not transport inflated tyres if sending a bike please deflate the tyres. Bikes, when they are boxed up, can be quite large and bulky so it's not practical to queue at the Post Office. When you book a courier online with Parcel Monkey you can arrange it so that the driver will come to your home or work address to collect the bike, leaving you with the simple task of handing over your box to the courier. You can add extended liability when you book a courier to protect you against loss or damage, plus our courier services come with tracking so you can see when your bike has been delivered. Please note unboxed bicycles are not permitted- due to the potential for damage to the bicycle, together with the possibility of its awkward shape causing problems for our couriers’ systems (bikes have got bits that stick out!) you must have the bike boxed up. New bikes won’t present any shipping problems, if still in their original packaging. A used bike, however, will mean you have to obtain suitable packaging before you send it. It is worth noting, we also have helped many customers send exercise bikes too. How much does bike postage cost? The cost depends largely on the dimensions and weight of the bike itself. A small toddler’s bike may weigh 5 kg, for example, whereas an adult boxed bike may weigh three times as much and be twice the size. As a guide, children’s bikes can be sent for approximately £9.89 + VAT with tracking when sent via Parcelforce 24. 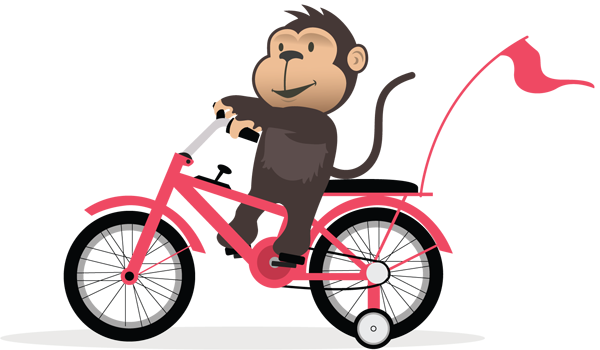 Parcel Monkey offer specialist large and heavy courier services ideal for posting adult bikes. Using the Parcelforce Large service, Tuffnells or the DX Freight network, all of which are available to book online with Parcel Monkey, sending a bike can be done for no hassle at all. Be sure to measure the box and get a courier quote based on the parcel once it is packaged and prepared, ready to be sent, to avoid any unwanted additional charges from the carriers. Failure to provide accurate dimensions and details can result in extra charges being incurred if the details you provide don’t match the item being sent! If you are selling items on Gumtree or eBay in your local area - you can make use of the Same Day courier services available on our website. By doing this, you can have the courier come and collect and deliver direct to the recipient, plus you can choose the size of delivery vehicle required too. Often, this is more cost-effective than using a normal courier. You might find our selling guides useful if you have a bike to sell online too. I need to send a long parcel, what is the maximum length you can deliver? Can I get my bike collected today? How do I calculate the volumetric size of my parcel? What is the maximum weight of package you will handle?